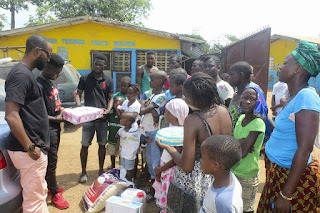 Stunna Spends Birthday With Orphans "What's the use of all the fame and riches if you can't make a positive impact on a person's life or make someone smile?" What's the use of all the fame and riches if you can't make a positive impact on a person's life or make someone smile? Being an artist for me has always been about being the voice for the voiceless, a beacon of hope and being a symbol of positivity. Yesterday my team and I decided to celebrate my birthday at the home of the less privileged kids, which was one of the most humbling experience I've experienced during my years walking this surface. I believe we're all interconnected and God blesses a person so that he can be a blessing to another. God knows my heart and I pray that he continue to bless me so that I can help make more positive impacts and make more kids smile. I never would've posted a single picture about this generous act, THE ONLY REASON I DID IS BECAUSE I WANT TO INSPIRE SOMEONE READING THIS TO BE A LIGHT IN THE DARKNESS FOR SOMEONE. God is great, and he's great all the time. It takes the power of one. I hope you are inspired. I know I am.